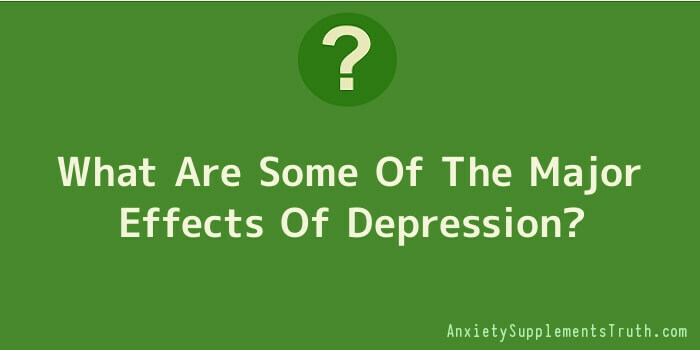 What Are Some Of The Major Effects Of Depression? If you are even wondering what are some of the effects of depression, then it most likely means that someone you know who is close to you, or even you yourself, are suffering from depression. While it is very important to know what some of the effects are, it is also important to understand how to avoid those effects, and furthermore, it is very important to seek help and try your best to control the depression either through specific psychological techniques or through the help of medication. There are definitely ways to avoid feeling depressed, and it is important that you take any precautions that you can to protect yourself and those around you. Some of the major indicators that an individual could be suffering from the effects of depression are that they may seem more sluggish in general. If you have noticed that they just seem slow down and not be engaged, whether at work, school, or at home, then they may be suffering from depression. These individuals will be noticeable by their suddenly strong apathy and their lack or desire to be close to people or get involved; even with their own family. People who are showing the effects of depression will not all show it at the same intensity, either. Some people might be able to have it under control for a great deal of time, while others are less able to contain their desperation feelings. Some individuals will allow it bother them quite often, but others will be haunted nearly all of the time, no matter how strong the feelings are. It is important to remember that the effects of depression are a serious matter and should be looked at as if they are extremely dangerous regardless of the severity. While any given individual might not show off the effects of depression that well, if you do notice warning signs, then you should keep an eye on that individual and maybe talk to them to get a straight answer. Depressed individuals are more likely to be tired and fatigued, to show severe apathy (even towards things that they loved before), and even to become sick more frequently than others.